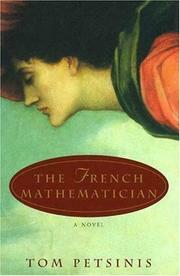 Australian poet and novelist Petsinis makes his American debut with an engaging historical drama: the political and religious tumult of early-19th-century France seethes behind the life of a prodigiously gifted mathematician, Evariste Galois. As a character controlled by his own rapture, however, Galois is evoked less convincingly. Galois— brief life (1811—32) is chronicled from the time of his teenage years—when his intellect endures the insufferable banality of a provincial education and, later, the frustrations of academic bureaucracy—to his certain death after a misguided attempt at love. He’s depicted as a fervent, brilliant, self-centered youth whose inward convictions destroy him. Early on, Galois— obsessive engagement expresses itself in his ferocious mathematical talent, and then, after the suspicious death of his Republican father, takes form as his equally passionate revolutionary stance—both of which guide him to grief. Galois’ story itself follows a fairly routine dramatic arc, from burgeoning talent and an indifference to convention, through a series of disappointments, to a culminating disillusion and reconciliation: On the eve of his death, Galois pens a last will and testament containing the summation of his mathematical insights (only later recognized as the work of a genius). But author Petsinis is often unable to avoid the yawn spots, the thickets, of mathematical, philosophical, and political exposition that prompt a reader to flip ahead for the next plot episode—despite the resurrected appearances of the Ghosts of Mathematics Past (Pascal, Newton, et al.) who offer cautionary meditations about math. Oddly, Galois’ governing passions remain mostly inert for the reader, and at his death, his heart seems largely unrevealed. Petsinis does develop a sense of Galois’ France with great fluency and obvious knowledge. Yet had Galois collected stamps or repaired shoes, instead of doing what he did, the novel would have forfeited its appeal mainly, or only, to mathematicians.